"Of all my many murders, committed for love and for better reasons, the first was the most important.... so I hereby commence my account with the unembellished truth: Reader, I murdered him." This is not your mother's Jane Eyre. This is not the tale of a shy, forlorn youth who suffers the throws of misfortune with quiet grace and dignity, who soliloquizes the moralities of integrity, virtue, and right over wrong. No, this is the tale of a put-upon girl who fights back, asserts herself, and takes vengeance and revenge into her own two bloodied hands. 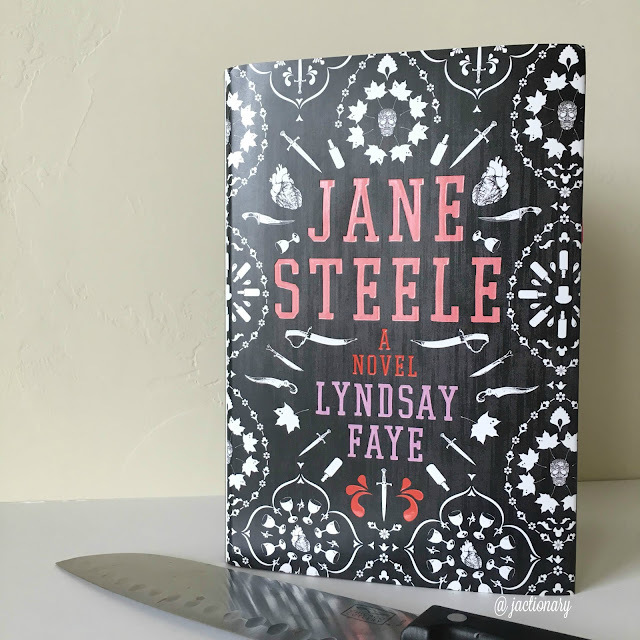 I was anxious to get my copy of Lyndsay Faye's latest historical fiction novel, Jane Steele, wherein she retells Charlotte Bronte's famous Victorian novel with quite the murderous twist. With this year marking Charlotte's two-hundredth birthday, many new release titles are delving into the odd, tragic, reclusive, and genius minds of the Sisters Bronte (see my recent post on The Madwoman Upstairs by Catherine Lowell). Taking one of the nineteenth century's most famous lines "Reader, I married him" and changing it to "Reader, I murdered him" (and one could add "and him, and him, and him..."), Lyndsay Faye turns Jane Steele into a serial killer. Divided into thirds, the first section begins with nine-year-old Jane's life at Highgate House. Having never known her father, witness to her mother's mental illness, and subjected to the cruelties of her aunt and cousin, Edwin Barbary, Jane's story is immediately intriguing. Several years her senior, Edwin sexually harasses his "favorite" cousin and one day during an assault, Jane fights back and shoves Edwin off of her. Standing on loose rocks, the push sends Edwin down the cliffside to his death. Though acting in self defense, Jane begins lying to everyone around her--including the police--and feels the weight of the unintentional murder weigh upon her soul. After her mother's suicide, Jane decides to bury her heart within her chest and walk forward in life embracing darkness: "If I must go to hell to find my mother again, so be it: I will be another embodied disaster. But I will be a beautiful disaster." Hereafter, Jane chooses to leave Highgate House to attend the infamous female boarding school Lowan Bridge. This first section--Jane's originations at Highgate House, her first murder, the cruelties of school at Lowan Bridge and its truly horrifying headmaster Mr. Munt--was the best written section of the entire book. The story has a strong setting, grasp of Victorian life and language, and Jane's mind is a dark, dark place to be. 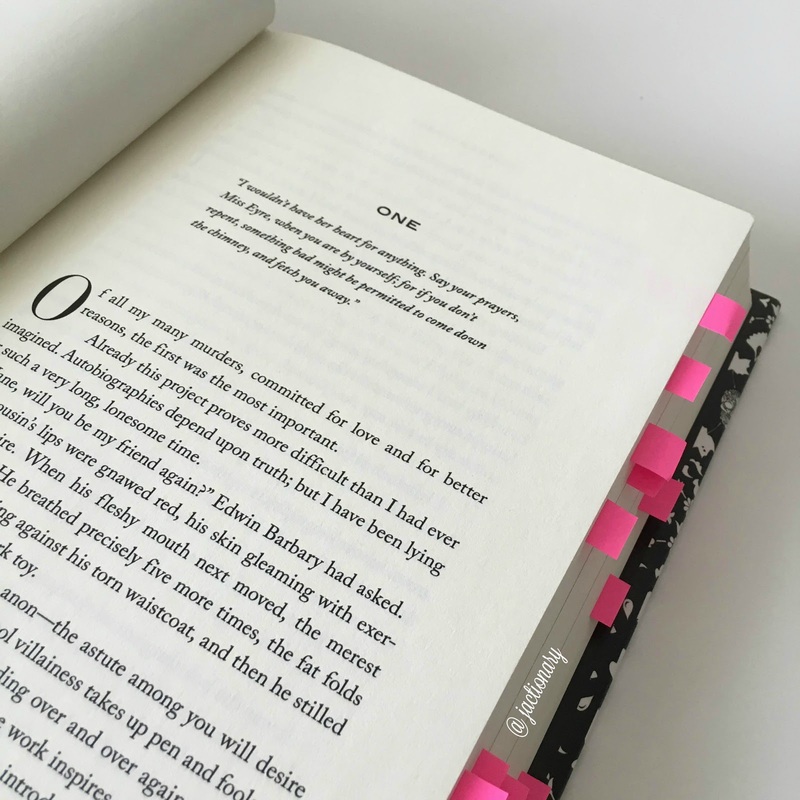 Her actions are terrible but many readers are arguing that they are also full of gray area. Her adventures once she flees Highgate House are when things really start get strange. That's right, starts to get strange. If the beginning wasn't atypical enough, just wait. Jane travels from one place to another, the number of her victims increases, and she grows in both age and cruelty. She spends time on the streets, pursues some lurid vocations, and eventually ends up back at Highgate House posing as a governess for a girl named Sahjara (pronounced "Sah-jara" just as it's spelled). The estate's new owner, Charles Thornfield, is increasingly intriguing to Jane because it is clear both he and everyone else at Highgate possesses dark secrets. I have to confess I struggled through a large portion of the book's second section as much of it felt like an entirely second novel. Though I frequently tagged passages at the beginning, I increasingly found myself solely marking major plot points. It also seemed that Jane's character was uneven during parts of the climax. Her self-assurity, impulsiveness, and lack of fear and regret come into question when she meets Thornfield and repeatedly faints, feels timid, and acts, well, like a stereotypical Victorian lady would act. Isn't she supposed to be the polar opposite of that? Partway into the third section, however, characters, backstory, and repeated plot set-up seem to have worked through their rough parts and I was once again curious about where the story would go. If you like mysteries, suspense novels, and are a fan of Jane Eyre, I'd definitely recommend this book. That being said, it is a book about a serial killer so you can't feign to go in blindly with a book tackling this subject matter for its main character. Have you read Jane Steele?